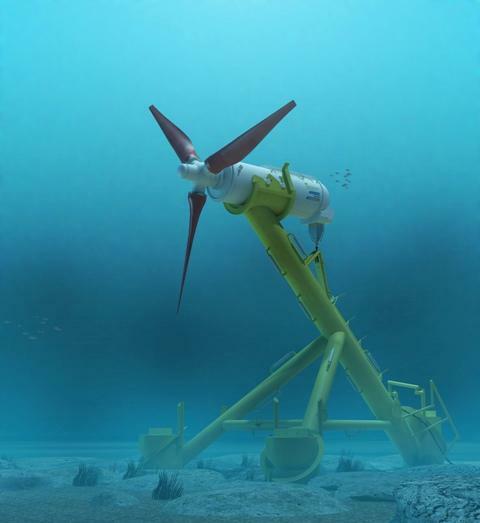 An underwater turbine that is set to be used in Scotland’s first and only consented tidal power project has successfully completed an initial testing period in Orkney, and is providing electricity for homes and businesses on the island of Eday, one of Orkney’s northern isles. The 1MW power generator was installed last December, in some of the worst weather conditions Scotland has experienced in more than a decade, and has since been undergoing a range of tests in the fast flowing tidal waters around Orkney. The initial testing period has been very positive with the device achieving full export power. The test device in Orkney aims to fully prove that the technology can operate efficiently in Scotland’s fast flowing tides, that monitoring and maintenance operations can be honed and to help drive down costs in operations and installation. ScottishPower Renewables (SPR) plan to use this technology as part of the world’s first tidal turbine array in the Sound of Islay. The company’s plans to develop a 10MW tidal array in Islay received planning consent from the Scottish Government in March 2011. Keith Anderson, CEO of ScottishPower Renewables said: “The concept of generating electricity from the natural movement of the tide is still relatively new – and test projects like this are vital to help us understand how we can fully realise the potential of this substantial energy source. “The performance of the first HS1000 device has given us great confidence so far. Engineers were able install the device during atrocious weather conditions, and it has been operating to a very high standard ever since. We have already greatly developed our understanding of tidal power generation, and this gives us confidence ahead of implementing larger scale projects in Islay and the Pentland Firth. The HS1000 tidal turbine has been developed by ANDRITZ HYDRO Hammerfest, whose majority shareholder is Andritz Hydro, and also includes partners Iberdrola and Hammerfest Energi. 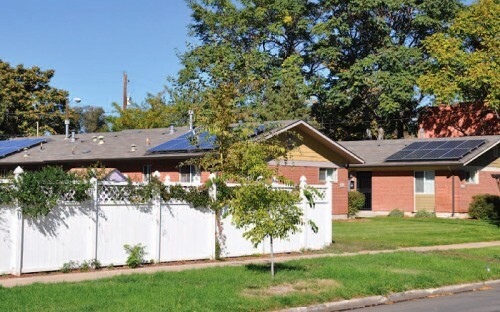 The 1MW machine can power the annual electricity needs of 500 homes. Seen as one of the world’s most advanced tidal turbine designs, a prototype device has been generating electricity in Norway for over 6 years. The design is based on a mixture of technology used in traditional onshore wind turbines, subsea oil & gas production and in hydro-power plants. 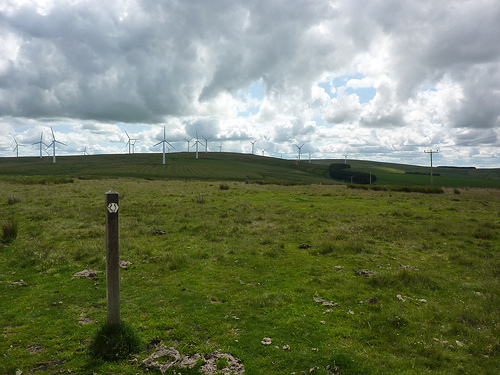 The turbine can be monitored from the European Marine Energy Centre (EMEC) base in Eday, but engineers can also operate and inspect the device from Glasgow using mobile connections and an on-board camera. 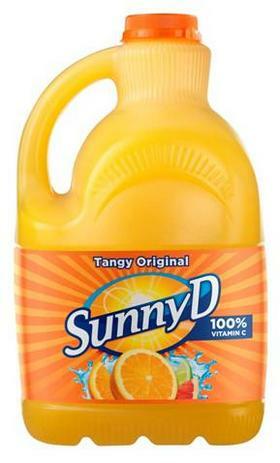 Sunny Delight Beverages has put into service a fleet of three compressed natural gas vehicles for distribution in southern California, in markets including Los Angeles, Mira Loma, Carson and Riverside. The move is expected to cut about 400,000 gallons of diesel fuel in 2012, and to cut well-to-wheel greenhouse gas by 23 percent versus diesel-powered engines. Transportation management and logistics provider Transplace said that it executed a transportation plan that focused on keeping costs down for the beverage manufacturer. The companies have a five-year arrangement. Transplace manages the carriers and the fueling options within the network, and Glacier Transportation deployed the fleet. A number of companies are testing a transition to CNG fleets. In January, AT&T ordered 1,200 Chevrolet Express CNG cargo vans for delivery to its service centers nationwide, in General Motors’ largest ever order of CNG vehicles. Refuse collection firm Waste Management announced a pilot program across four states to introduce natural-gas powered Rotopress waste collection trailers. Also, Veolia ES Solid Waste revved up Indiana’s first fleet of CNG powered refuse trucks in April. Electric car drivers could soon be able to charge their vehicles without signing up to different membership schemes for different regions, following the launch today of the UK’s first pay-as-you-go charging network. 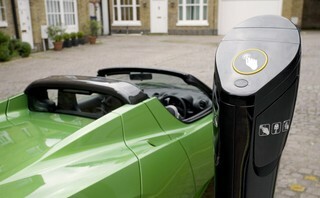 London-based electric car charging company POD Point aims to have around 620 chargers nationwide freely available on a pay-as-you-go basis by the end of 2012, with a view to more than trebling the size of the network to 2,000 charge points by the end of the following year. The company said it wants to do away with the current situation where drivers may find it difficult to charge their vehicle outside their local area if they do not subscribe to a charging scheme in a particular region. A company spokesman toldBusinessGreen that the new system would rely on charge cards to begin with, but POD Point envisages new forms of payments such as SMS or smartphone apps becoming quickly available. He added that POD Point is open to working with other charging networks and is currently in negotiations with charge point providers about integrating its pay-as-you-go model with their services. POD Point is Europe’s largest electric vehicle charge point supplier, having now shipped over 2,500 wall-mounted and street charge point units, and is the approved supplier for Toyota dealers throughout the EU. The POD Point Network follows last year’s launch of the POLAR scheme, operated by Chargemaster, which aims to fit 4,000 charging points across the UK’s 100 largest towns and cities by the end of 2012 to create the country’s largest charging network. The news also comes on the same day as Chargemaster announced POLAR will add 64 charge points across Oxford and the surrounding area, transforming the city into one of the EV capitals of Europe. Following the rollout, Oxford residents will have one charge point between every 2,391 citizens, compared to 4,029 in Amsterdam, 4,803 in Paris and 11,927 in London. There are already more electric car chargers than petrol stations in Oxford and another 50 chargers are expected to be added in the next 12 months, including a number of fast-charge points, while a further 100 charging points are available within 40 minutes’ drive. In addition, Chargemaster has signed a Memorandum of Understanding with Hertz to launch an electric car sharing club in Oxford, which would see 10 electric Nissan LEAFs made available to book online for rental by the hour, day or week. The cars are likely to be situated in university campuses, street locations, local car parks, major employers’ car parks, and other strategic locations across the city and surrounding areas. A man is attempting to drive an electric van from Nairobi to Johannesburg to highlight the reliability of zero carbon vehicles under extreme conditions. Adventurer and English teacher Xavier Chevrin set off on the UN-backed 4,800km trip at the end of last week, two years after driving from Shanghai to Paris – the longest ever journey made in an electric car. Chevrin will spend a month and a half battling through the bush of Kenya, Tanzania, Zambia, Zimbabwe, Botswana and South Africa in a souped-up version of a French electric postal van. The Citroen Berlingo has three batteries as opposed to the regular single issue, as well as raised suspension to cope with bumpy roads. The modifications enable the van to cover 500km without recharging the battery, which takes seven hours from empty using a standard 240V socket. But the car has no back-up generator so Chevrin will be reliant on local electricity infrastructure to complete the journey. The aim is demonstrate that electric cars are not only cheaper to run – the Shanghai-Paris trip cost less than $200 in electricity instead of $4,000 worth of diesel – but also better for the environment. According to a forthcoming report by the UN’s Environment Programme (UNEP), the current fossil-fuel based transport system accounts for a quarter of all greenhouse gas emissions and this figure is expected to rise to almost a third in the coming decades. “We have been using combustion engines for over a century, but now it is a new revolution,” Chevrin said. “Within a few decades it will be logical for everyone to have an electric car as it fits with the philosophy of having to be careful how we use energy.